Dezeen Wire: British architect David Adjaye and American artist Doug Aitken have revealed designs for a bitumen-coated pavilion that will be constructed at the Tate Liverpool gallery this autumn. The circular pavilion will be the venue for arts project The Source, where Aitken will interview a host of creative figures for British television channel Sky Arts. The pavilion opens to the public from 15 September to 13 January. 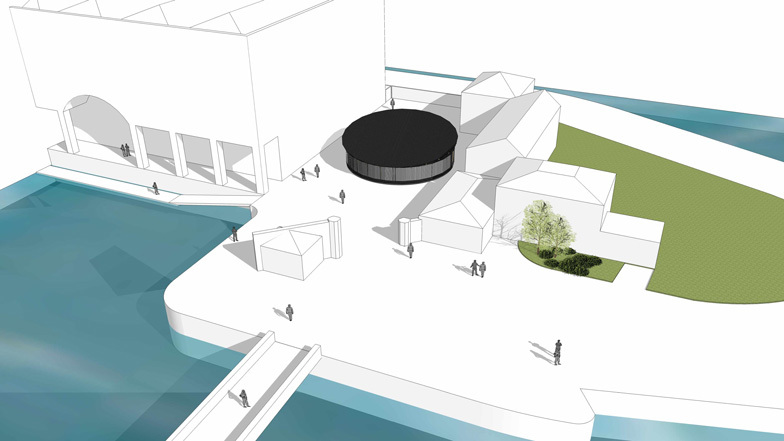 American artist Doug Aitken and British architect David Adjaye have collaborated for the first time to design a pavilion that will be installed outside Tate Liverpool on the city’s historic Albert Dock as part of the Sky Arts Ignition Series, which will go on show from 15 September 2012 - 13 January 2013. Sky Arts Ignition: Doug Aitken – The Source will be part of the seventh Liverpool Biennial. Sky Arts Ignition: Doug Aitken – The Source is the artist’s first public realm installation in the UK and features filmed conversations with some of the world’s leading creative figures. Participants of all ages and backgrounds, working across different art forms, respond to two questions: where does the creative idea start and how is it realised? Those interviewed include David Adjaye, Devendra Banhart, Thomas Demand, Liz Diller, William Eggleston, Jacques Herzog, Mike Kelley, Lucky Dragons, James Murphy, Philippe Parreno, Richard Phillips, Jack Pierson, Stephen Shore, Paolo Soleri, Tilda Swinton, Ryan Trecartin and Jack White. The Pavilion will be located in Mermaid Court, adjacent to the largest single grouping of Grade 1 listed buildings anywhere in England. At 14.2 metres in diameter, with a sloping roof that ranges from 2.8m to 4.8m in height, the pavilion will provide an immersive experience during the day, with a night-time presence created through the projection of Aitken’s work on the outer walls of the circular structure. Built from a wooden frame and a combination of corrugated acrylic and bitumen panels, the pavilion will be a temporary structure that deliberately separates Aitken’s work from the traditional gallery space in order to create a new cultural destination. The Sky Arts Ignition Series was launched in 2011 to support the creation of major new works of art as well as nurture emerging talent. Sky Arts Ignition: Doug Aitken – The Source is the first project in the series, which will see Sky Arts collaborate with six leading arts organisations from across the UK and Ireland in the creation of brand new works. For each of the chosen projects, Sky Arts will provide a cash investment of up to £200,000 and work with the arts partners to bring their projects to a wider audience, using Sky’s platform. Doug Aitken said: “This project is about the roots of creativity. Many of the people in this project are working in very diverse mediums and it’s that common thread that I’m interested in. The project is very much about the empowerment of the viewer. I want the installation at Tate Liverpool to be a destination: a place that one can go to and walk into this field of ideas. It will be a celebration of the power of the individual and the forging of a borderless new creative territory – I’m incredibly excited."